Laurence T. Fessenden (born March 23, 1963) is an American actor, producer, writer, director, film editor, and cinematographer. He is the founder of the New York based independent production shingle Glass Eye Pix. His writer/director credits include No Telling (written with Beck Underwood, 1991), Habit (1997), Wendigo (2001), and The Last Winter (written with Robert Leaver, 2006), which is in the permanent collection of the Metropolitan Museum Of Modern Art. He has also directed the television feature Beneath (2013), an episode of the NBC TV series Fear Itself (2008) entitled "Skin and Bones", and a segment of the anthology horror-comedy film The ABCs of Death 2 (2014). He is the writer, with Graham Reznick, of the BAFTA Award-winning Sony Playstation video game Until Dawn. He has acted in numerous films including Like Me (2017), In a Valley of Violence (2016), We Are Still Here (2015), Jug Face (2012), and Broken Flowers (2005). 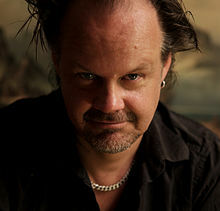 Larry Fessenden was born in New York City, New York. He attended St. Bernard's School, then Phillips Academy, from which he was expelled. He is married to Beck Underwood and the couple have one child. As an actor, screenwriter, director and film editor, he has worked, in addition to feature films, on such television projects as the NBC horror anthology Fear Itself (2008), directing the episode "Skin and Bones". He wrote the screenplay of Orphanage (2007) with Guillermo del Toro, an English-language remake of El Orfanato. Fessenden has worked as a mentor to young directors, such as Jim Mickle and Ti West. He has been a producer on projects including Ilya Chaiken's Liberty Kid (2007), Kelly Reichardt's Wendy and Lucy (2008), James McKenney's Satan Hates You (2010), West's The House of the Devil (2009) and The Innkeepers (2011), Joe Maggio's The Last Rites of Joe May (2011), and Rick Alverson's The Comedy (2012). Under his low-budget horror banner ScareFlix, Fessenden has produced films including West's The Roost (2005) and Trigger Man (2007), Glenn McQuaid's I Sell the Dead (2008), Maggio's Bitter Feast (2010), and Mickle's Stake Land (2010). More recently he has produced for prolific horror auteur Mickey Keating with Darling (2015) and Psychopaths (2017). As a character actor, Fessenden has appeared in numerous films, including Martin Scorsese's Bringing Out the Dead (1999), Steve Buscemi's Animal Factory (2000), Brad Anderson's Session 9 (2001) and Vanishing on 7th Street (2010), Jim Jarmusch's Broken Flowers (2005), Neil Jordan's The Brave One (2007), McQuaid's I Sell the Dead (2008) for which he won best actor at the Slamdance Film Festival; Reichardt's Wendy and Lucy (2008), Mickle's Mulberry Street (2006) and Stake Land (2010), Joe Swanberg's All the Light in the Sky (2011), and Ted Geoghegan's We Are Still Here. Fessenden also starred in the Sundance Film Festival picture River of Grass (1994), which was Reichardt's debut feature, and Margarita Happy Hour (2001) directed by Chaiken. He has appeared on television in Louie, The Strain, and as himself in National Geographic's Brain Games. In 2010, Fessenden co-produced Tales from Beyond the Pale, with Glenn McQuaid, a 10-episode audio series  now in its fourth season. In 2011, he released his third rock album with the band Just Desserts, an on-going partnership with songwriter Tom Laverack. In 2012, he executive produced and was interviewed in the documentary Birth of the Dead, which examines the legacy of Night of the Living Dead. In 2016, he produced, acted, and served as cinematographer in his son Jack's feature debut, Stray Bullets. The same year also saw Fessenden release a book titled, Sudden Storm, A Wendigo Reader. Fessenden has also established a strong presence in the video game world. In 2015, he and Graham Reznick collaborated on writing the video game Until Dawn. Fessenden also played the role of a mysterious stranger armed with a flamethrower in the game itself. The game earned positive reviews and would go on to receive the "Original Property" award in the 2016 BAFTA Games Awards. Fessenden and Reznick also set a Guinness World Record for "Longest script for a graphic adventure videogame," with their script reaching 1,000 pages. The two writers would team up again in 2016 to develop a spin-off game known as Until Dawn: Rush of Blood, and later in 2018 for the Until Dawn prequel, The Inpatient. Fessenden has run the company Glass Eye Pix since 1985 with the mission of "supporting individual voices in the arts." Glass Eye Pix continues to nurture young talent, most recently producing the debut features of Robert Mocker (Like Me, starring Addison Timlin and Fessenden), Ana Asensio (Most Beautiful Island), and Jenn Wexler (The Ranger). Fessenden is currently completing his Frankenstein-themed feature, Depraved, which he wrote, directed, and edited. 2014 The ABCs of Death 2 Segment: "N is for Nexus"
2008 Fear Itself Episode: "Skin and Bones"
^ a b c Southern, Nathan. "Larry Fessenden Biography". Allmovie. Retrieved August 4, 2011 – via The New York Times. ^ Adams, Sam (August 31, 2009). "Larry Fessenden". The A.V. Club. Retrieved January 19, 2014. ^ Truitt, Brian (2013-06-25). "Sunday Geekersation: The many horrors of Larry Fessenden". USA Today. Retrieved January 19, 2014. ^ "Icons Interview with Larry Fessenden". IconsOfFright.com. Retrieved January 19, 2014. ^ "New York horror mogul Larry Fessenden". Fangoria. ^ a b Kohn, Eric (April 15, 2011). "A Kingmaker in the Realm of Cheapie Horror". The New York Times. Retrieved January 19, 2014. ^ Casciato, Cory (October 23, 2013). "Larry Fessenden on Birth of the Living Dead". Westword. Retrieved September 8, 2015. ^ McDonagh, Maitland (February 8, 2017). "High School Auteur: Teenager Jack Fessenden makes an auspicious genre feature debut with Stray Bullets". Film Journal International. Retrieved February 24, 2017. ^ Graham, Roy (2015-10-26). "Here's What Happens When Great Indie Horror Directors Make a Video Game". IndieWire. Retrieved 2017-02-24. ^ "Larry Fessenden and Gualberto Baña receive the Honorary Maria Award in Sitges 07'". "Must-Read Interview with 'Bitter Feast' Indie Producer Larry Fessenden!". Bloody-disgusting.com. Retrieved 2011-08-04.